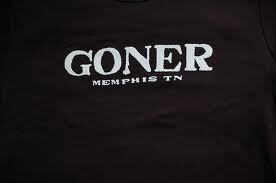 Home :: Goner Label :: Goner T-shirt-white on black-Men's size XXL - Free Shipping! 52% COTTON 48% POLYESTER CANVAS BRAND ULTRA SOFT ULTRA COMFORT. EVER WORN A CLOUD? THIS IS IT.